Leading public health and medical organizations have filed a Petition to the Federal Trade Commission urging the agency to take action against the world’s largest tobacco companies for deceptively advertising cigarettes to America’s youth on social media. You can view the full petition here. There's something behind the cigarettes you see on social media: a deceptive strategy from Big Tobacco to addict the next generation of smokers. What are tobacco companies doing? 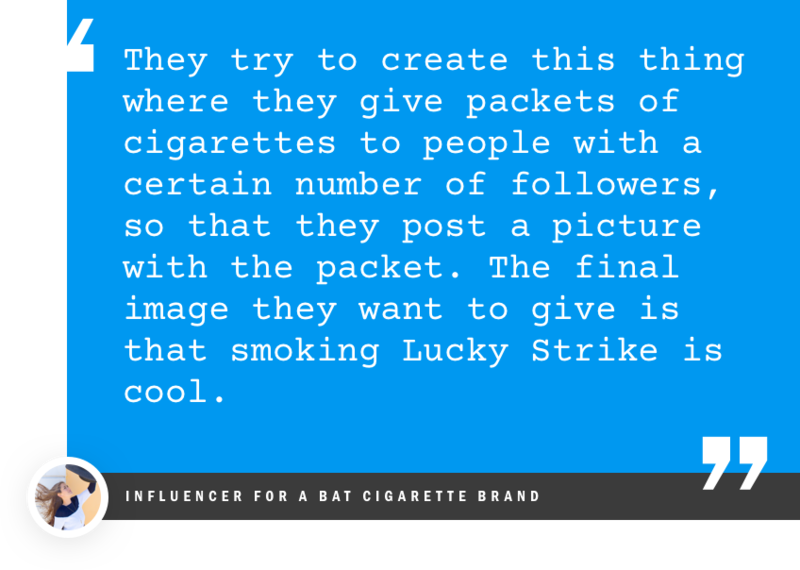 Tobacco companies are secretly paying social media stars to flood your newsfeed with images of their cigarette brands. 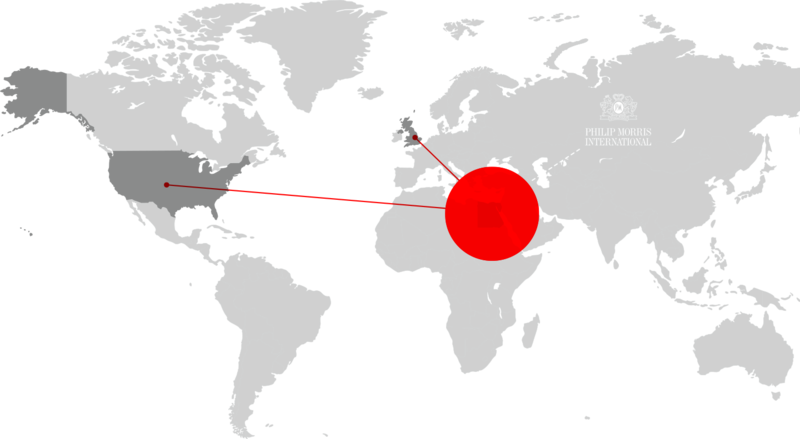 Philip Morris International, British American Tobacco, Japan Tobacco International and Imperial Brands are subverting tobacco advertising laws, flying under the radar of government regulators and abusing the policies of social media platforms to market cigarettes to youth. It’s all part of a deceptive strategy to addict the next generation. Reached with posts: Argentina, Australia, Belgium, Belize, Chile, Croatia (Hrvatska), Cuba, Denmark, Dominican Republic, Finland, France, Germany, Great Britain, Greece, Indonesia, Israel, Italy, Kenya, Luxembourg, Mexico, Morocco, Netherlands, Portugal, Romania, Russia, Slovenia, Spain, Sweden, Switzerland, Thailand, United Arab Emirates, United States, Venezuela. Reached with posts:Argentina, Australia, Brazil, Canada, Croatia (Hrvatska), Czech Republic, France, Georgia, Germany, Great Britain, India, Indonesia, Italy, Japan, Kyrgyzstan, Mexico, Moldova, Nepal, Netherlands, Pakistan, Poland, Romania, Russia, South Africa, South Korea, Spain, Syria, Ukraine, United Arab Emirates, United States, Uruguay, Venezuela. Reached with posts: Australia, Belgium, Czech Republic, Denmark, Germany, Great Britain, Guatemala, Hungary, Indonesia, Ireland, Japan, Madagascar, Malaysia, Nigeria, Peru, Rwanda, South Korea, Spain, United States. Reached with posts: Egypt, Great Britain, United States. Reached with posts: Brazil, South Korea. Reached with posts: Armenia, Bosnia and Herzegovina, Canada, Czech Republic, Denmark, Egypt, Germany, Great Britain, Greece, India, Italy, Macedonia, Morocco, Norway, Philippines, Republic of Serbia, Russia, Saudi Arabia, South Africa, Taiwan, Turkey, Ukraine, United Arab Emirates, United States. 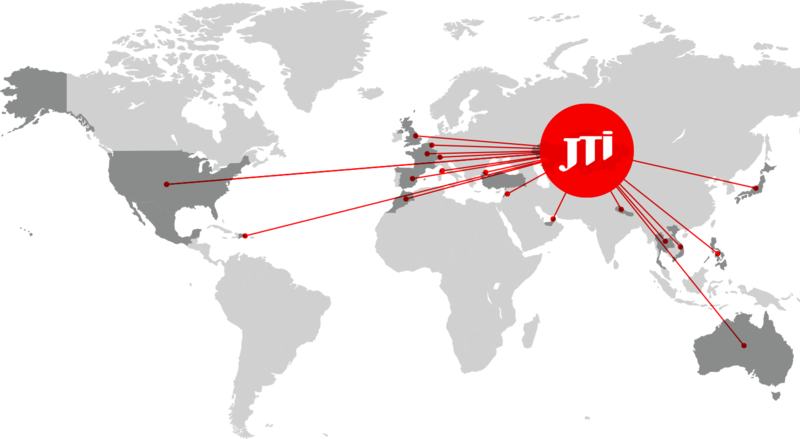 Reached with posts: Angola, Australia, Belgium, Dominican Republic, France, Great Britain, Japan, Kazakhstan, Lebanon, Mexico, Morocco, Nepal, Philippines, Spain, Switzerland, Thailand, Turkey, United Arab Emirates, United States, Vietnam. Young social media stars are paid to make smoking look cool. Tobacco companies and their marketing firms engage popular social media influencers to help promote cigarettes and other tobacco products to their social media communities. The influencers’ posts are designed to appear authentic, but are actually carefully composed to advertise cigarettes. Influencers are recruited based on their youthful appearance and number of followers. 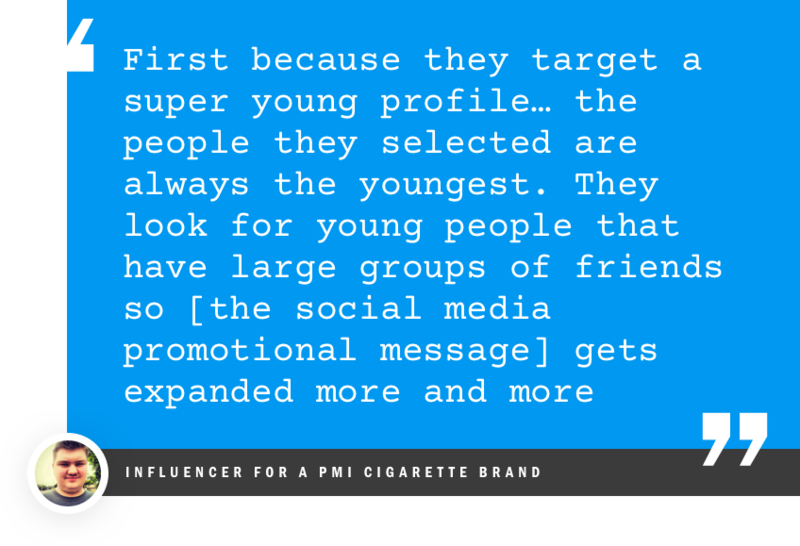 Tobacco marketers work with influencers to maximize the quality and reach of their social media posts. 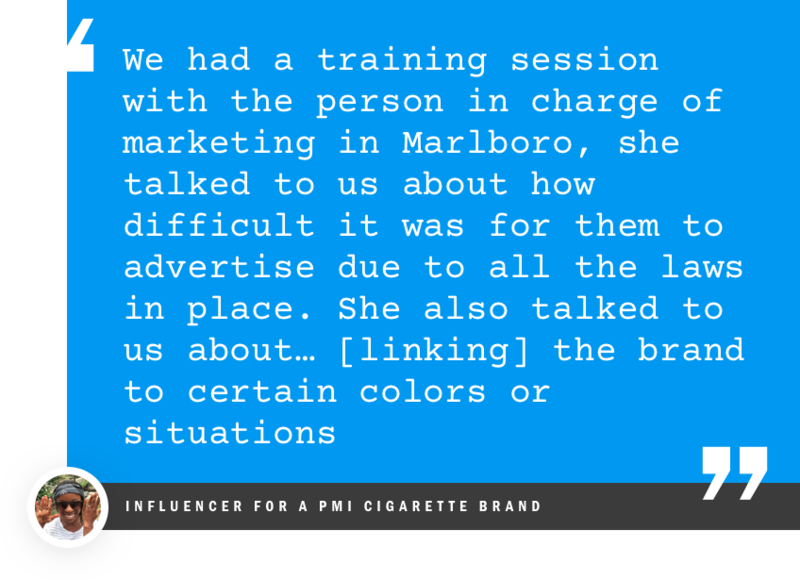 Influencers are given explicit instructions on what cigarette brands to promote. Influencers are paid to promote tobacco to their followers and provided with free cigarettes and other incentives. 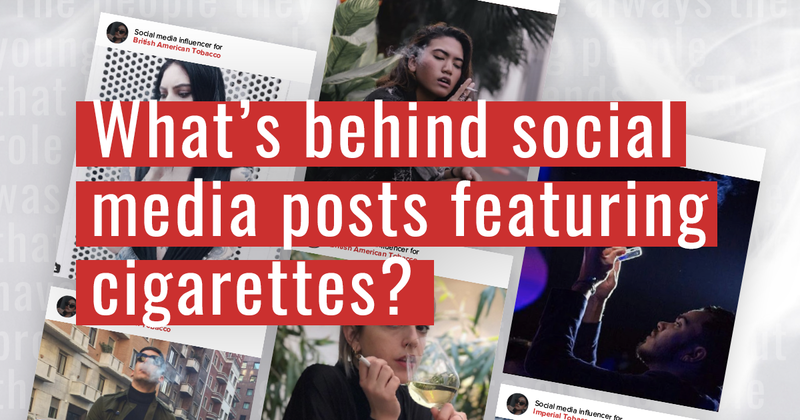 Tobacco companies like Philip Morris International, British American Tobacco, Japan Tobacco International and Imperial Brands want the photos to blend into your newsfeed, not look like paid promotions for their brands. 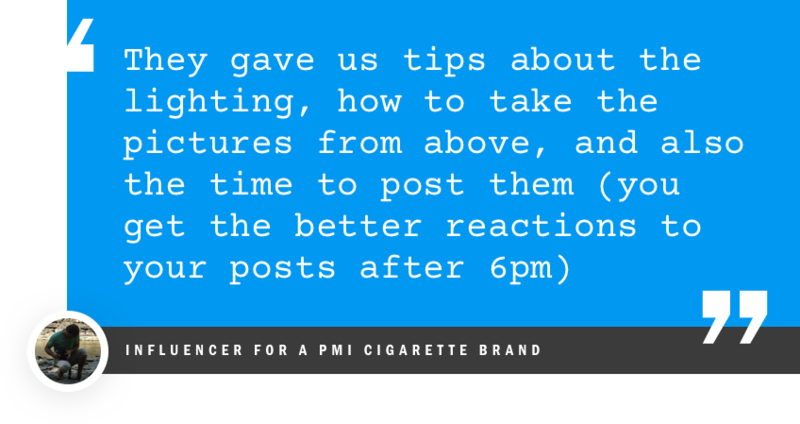 Some influencers were instructed to cover the health warnings on cigarette packs in posts. The goal of tobacco companies’ social media marketing strategies is clear: to make smoking look cool. 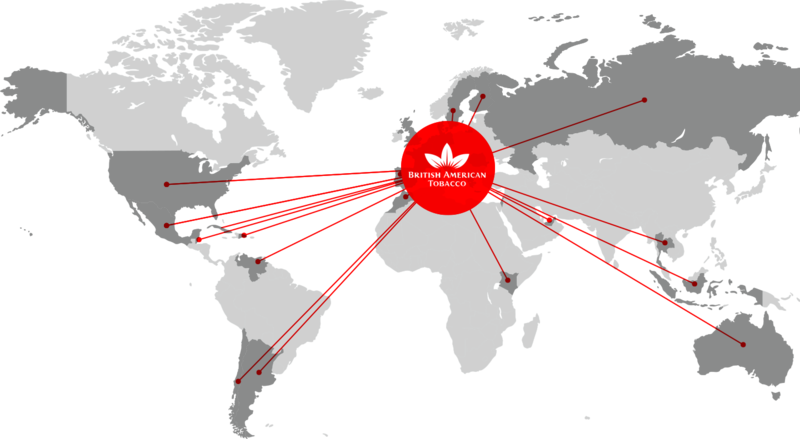 British American Tobacco, Japan Tobacco, Imperial Brands and Philip Morris International host trendy cigarette themed parties all over the world. When partygoers post photos from the events on social media, big tobacco’s digital footprint expands exponentially. The parties are designed to promote cigarette brands and generate significant social media content to ensure maximum visibility for brands like Marlboro and Lucky Strike. Facebook, Twitter and Instagram don’t let tobacco companies pay for ads on their platforms, and have clear policies on branded content. But by using influencers under the radar, tobacco companies get around those policies. 1. 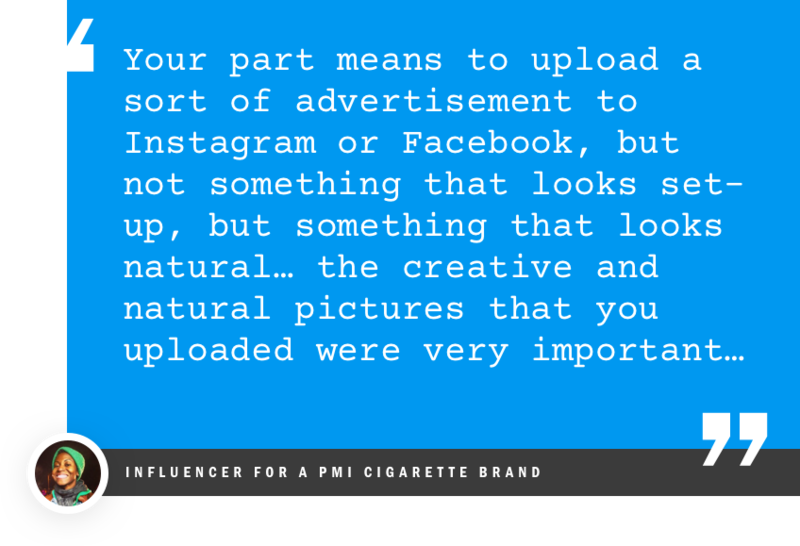 Tobacco companies don’t tell influencers to include “#ad” or “#sponsored” in their posts, which avoids being caught by social media platforms’ official ad systems. 2. The posts use subtle campaign hashtags like #likeus or #nighthunters, which fly under the radar but are actually campaigns by British American Tobacco and Philip Morris International. 3. 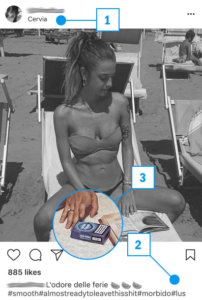 The posts include tobacco products in the images, which are impossible to differentiate from an influencer’s own everyday content. Facebook, Twitter and Instagram can play a critical role in stopping online tobacco advertising if they enforce their policies to block tobacco advertising in influencer content. Around the world, governments have banned or restricted tobacco advertising. In fact, 181 Parties are already obligated to ban all tobacco advertising – including internet advertising – under a global treaty called the WHO Framework Convention on Tobacco Control. But tobacco companies are undermining those efforts. Did you know tobacco companies are secretly paying social media stars to get around advertising standards? We need to investigate tobacco advertising to stop them. Are you on Facebook, Twitter or Instagram? Lead by example, pledge to make your social posts tobacco-free. See our additional information, media and resources. Follow TakeAPart on Facebook and Twitter to continue exposing tobacco advertising on social media. *Influencer quotes are taken from the FTC Petition. While the images are indeed related to tobacco marketing campaigns, the quotes shown are not attributed to any influencer or social media post featured on this website.